We have reached a crossroads marked by increasing natural disasters, intensified storm systems, polar ice caps melting at rates 30 years ahead of global scientists' predictions, and island nations literally going underwater. All the while we are in the midst of an economic recession screaming for a new 21st century economy. Unless we act decisively, climactic disruptions threaten to drastically alter our way of life. The 1Sky Solutions are grounded in scientific necessity. They are the bottom line of what's needed to dramatically reduce carbon emissions while maximizing energy efficiency, and renewable energy. They also represent significant economic promise. By pivoting to a clean energy economy, we can relieve our dependence on foreign oil, unlock the potential of sustainable industry and usher in a new era of prosperity and green jobs. Clinging to an outdated fossil fuel economy will hasten our decline as a competitive nation, leaving us hostage to volatile market conditions and continued economic decline. Through direct lobbying by everyday Americans, creative local actions, and work in DC by the 1Sky staff, we push our elected officials to lead on the great moral imperative of this climate fight. Together, we can convince our leaders to chart a new direction—away from the catastrophes of climate change and make a better future for ourselves and the next generations. Americans are building support for climate action across the United States using online and social media as well as traditional neighbor-to-neighbor outreach. This is your chance to change the course of history, so get involved today! In 2006, a powerful climate movement was itching to be born. Despite an extraordinary outpouring of support and commitment, the climate movement still lacked the coherence and moral power to drive solutions as big as the problem. Late that year, a small group of diverse leaders gathered and asked themselves: What would it take? How could we support the emergence of a bold, powerful, coherent climate movement? How could we unify the growing public demand for climate solutions that deliver broadly shared economic opportunity? Beginning in April of 2007, these leaders and others met with leaders of environmental, faith, human rights, anti-poverty, business, and youth groups as well as policy analysts, communications experts, climate scientists, and many others. They determined that what we needed more than anything was not another new institution, but a place to stand together above the level of our separate institutional imperatives and political alignments. We needed a platform on which we could converge to create irresistible public demand for a clear, simple, specific national policy platform that would set America on the road to real solutions. That place, that platform, became 1Sky – not a new organization, but a collaborative campaign aimed at bringing hundreds of diverse organizations together in support of a unified platform for transformational change.1Sky became a collaborative national campaign for strong federal action to tackle global climate change and invest in building the clean energy economy of the future. 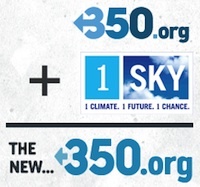 Now one of the largest national climate campaigns in the country, 1Sky works to combine the force of 643 allied organizations, 203,500 committed climate advocates, 4,256 volunteer leaders in 50 states, and our own experienced team to effect change in the nation's capital. In all of its diversity, a powerful climate movement is beginning to converge. The movement will never fly a single flag, or narrow itself to a single brand or institution, nor should it. Unity, not uniformity, is our goal. We are many; we are diverse; we are growing. And we need to stand together.